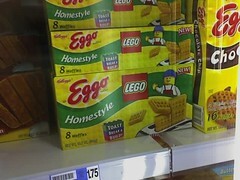 Mike Pirnat: LEGO my Eggo! Saw this at the grocery store today and had to document it for posterity: waffles you can connect like LEGO bricks! Truly, a concept both utterly brilliant and at the same time deeply frightening. Music: Firefly soundtrack - "Cows/New Dress/My Crew"